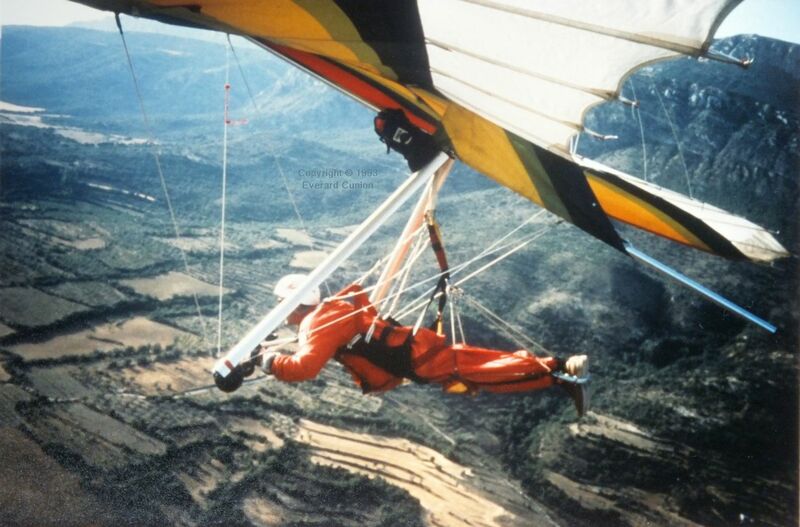 This page follows Hang gliding 1989. 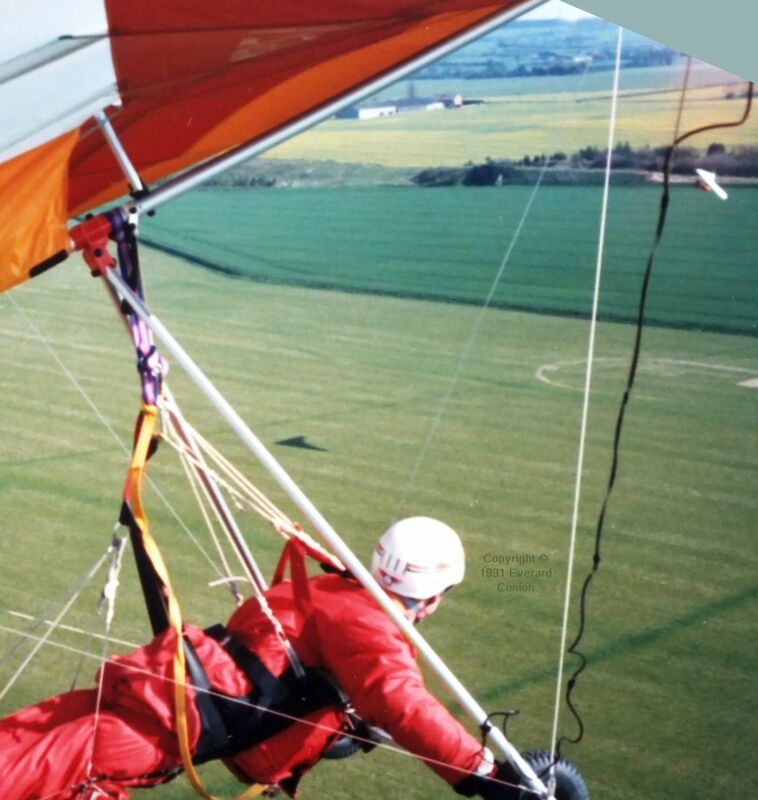 From the the Canary Islands off the east coast of Africa, via flat-lands of Norfolk in England, then mainland Spain, this page ends with a hang gliding flight simulator rigged in a back garden on the south coast of England. I made my first ever cross-country flight from Mala on Lanzarote, one of the Canary islands. (A cross-country flight is one where you land significantly far away from where you took off.) 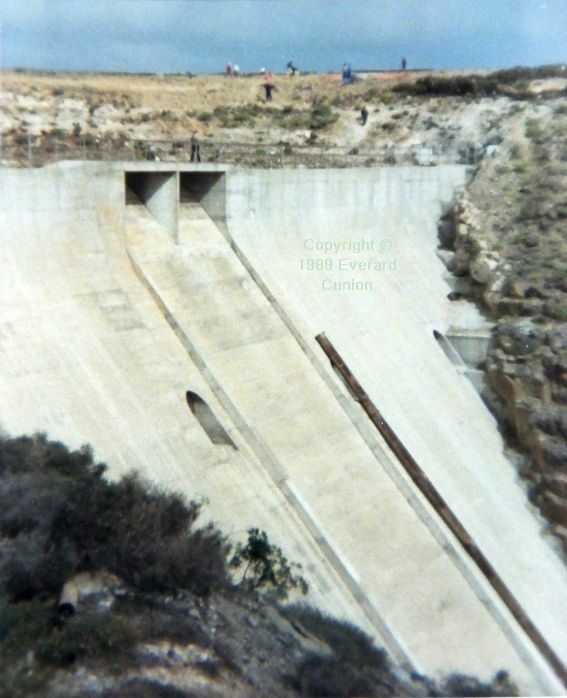 For reasons I no longer recall, I found myself behind the hill and also behind the lake with the dam, the wind having increased so that I felt that I might be caught in rotoring wind behind the hill if I flew forward. Unfortunately, down wind (behind me) where the ground rose, cloud had lowered to below the higher ground, blocking my escape route in that direction. I therefore started off to my right (south). As it turned out, I encountered rising air in the form of thermals frequently. By circling in them, I gained height until they dissipated at I guess about 1500 feet, whereupon I continued my cross-wind journey until I encountered the next thermal. From the Mala car park, you carry your gear across this dam to the hill-top rigging and launch area. 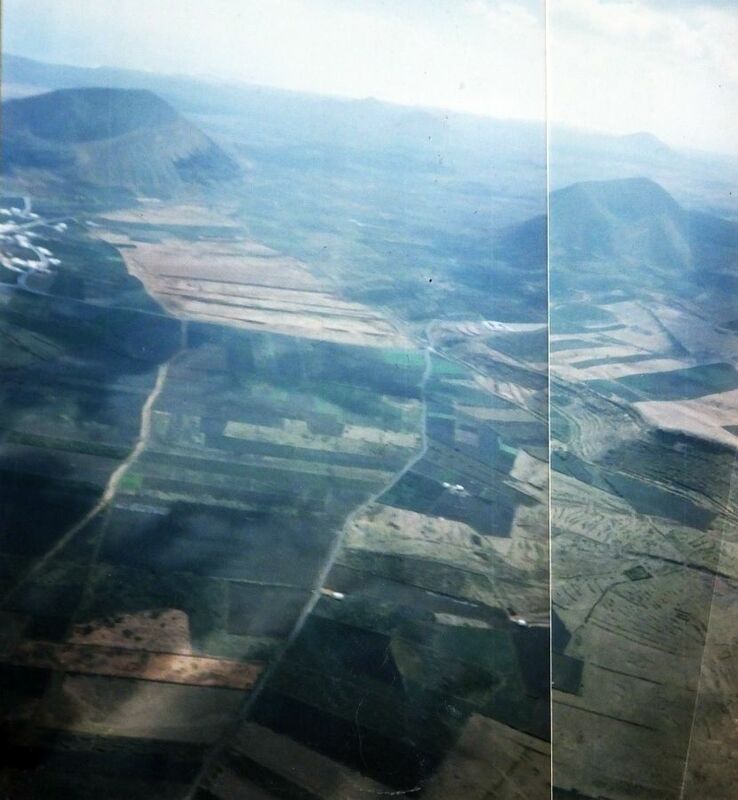 I flew between the extinct volcanoes in the photo because the road went that way. Landing near a road is safer than landing in the middle of nowhere because, if you crash land sub-optimally and are injured, someone is likely to see you. In addition, a nearby road makes for easier retrieval. In the following photo I am circling to climb in a thermal — possibly one generated from the extinct volcano up wind, over which sits a cloud shadow, likely caused by a thermal it triggered. Pilots throughout the world discovered the thrill of flying distances and landing out. They looked back at their footsteps in the field and realized they had arrived as if by magic in a new world far, far away. I eventually landed in a stony field and, after de-rigging and hiding my wing, and after much walking, a British couple gave me a lift back to the hill. Some people consider the latter stage of cross-country flying part of the adventure, but I find it a burden, which is one reason I am reluctant to fly cross-country. 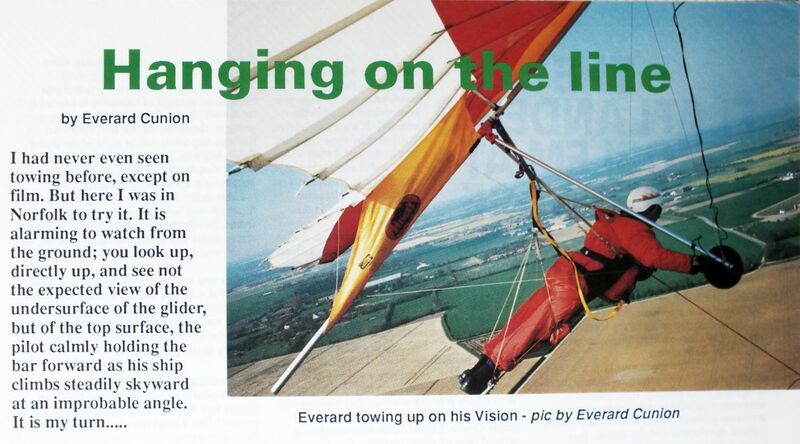 In this photo, I am flying across the Norfolk flatlands by circling in a thermal on a cold winter’s day in 1991. 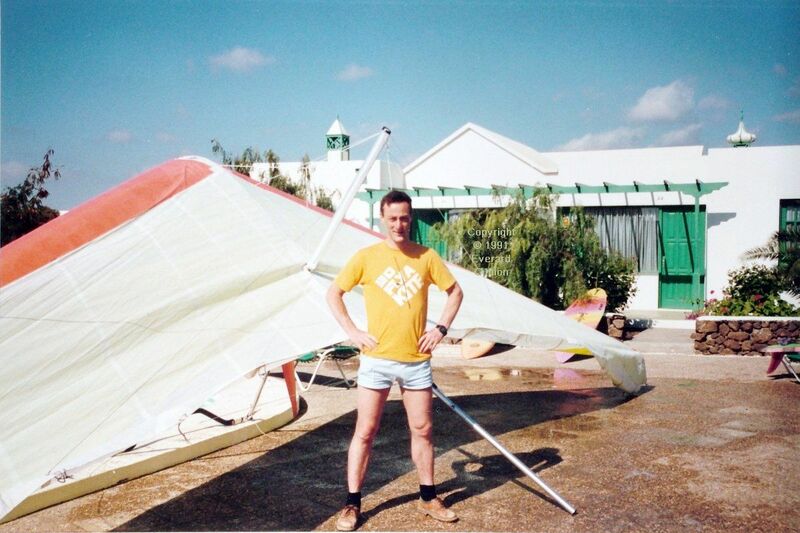 It was my second ever cross-country flight and was part of a competition hosted by the Lejair hang gliding school (the same people who run the Lanzarote expeditions). With a forest of massive power lines ahead, I landed in a field beside a road near a village. After de-rigging, I walked the short distance to a public phone box, called in, and set out to return to my gear while wondering how many hours I would have to wait. I had not gone more than 100 metres down the street when the retrieve vehicle pulled up! That is the way to go cross-country flying! Wendling field was used in World War II by the USAAF as a B-24 base. It is used here by the Lejair hang gliding school. 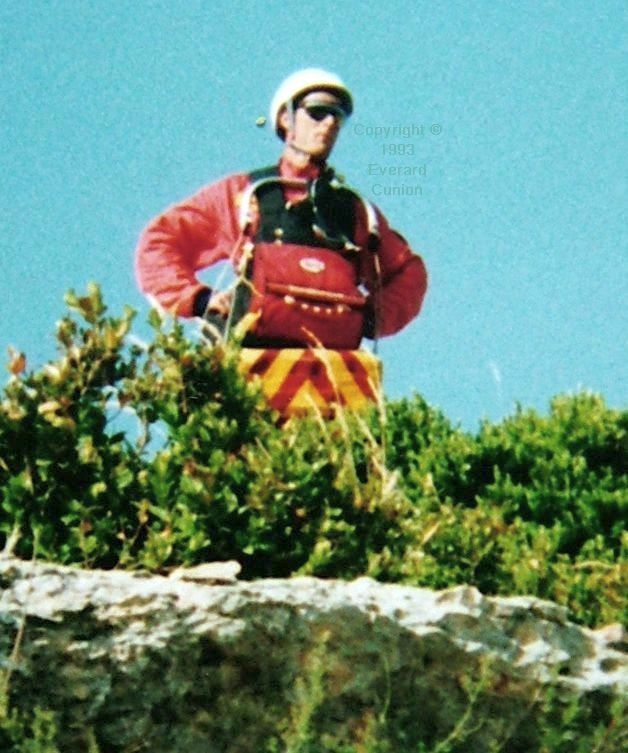 Chief instructors Tony and Rona Webb pioneered the use of winch launch training in Britain after learning the technique from Donnell Hewitt of Texas, among others. At upper right in the photo, another hang glider is being winched into the air. The high angle demonstrates the rocket-launch aspect of winching into the sky. The pilot of that glider, incidentally, is a US Air force F-4 Phantom pilot who was at that time stationed nearby. I wrote a one-page article about my winch launch training in the BHPA magazine. The PacWind Vision was designed by Frenchman Jean-Michel Bernasconi. For a bit more about him, see the section titled Entrepreneur in Mid-day lightning in Vermont, my review of the documentary film 1978 Pico Peak International Hang Gliding Meet by Francis Freedland. The sail is rucked because the airfoil-shaped aluminium alloy battens have not been inserted. 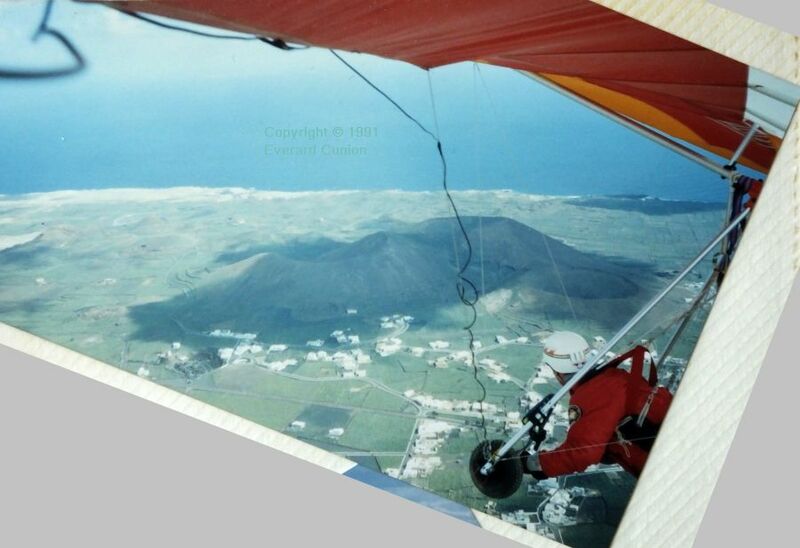 The need for a hang check is obvious from this photo I took of the rigging and launch area at Famara, Lanzarote, Spanish Canary Islands in early 1992. British paragliding instructor Dave Sigourney was killed near here a few years afterwards while assisting another pilot to launch. The cliffs in the distance rise to more than 2 000 ft and the sea meets their base. You cross a spur (visible between Gordon and Rona’s heads) to reach the sea cliff. Flying close in, watch out for vertigo caused by your fly-on-the-wall proximity to the cliff face. As you climb in the lift, eventually rising to level with and then above the cliff top, the crashing of the waves against the rock far below is attenuated to an amorphous hiss. The white golf ball on the cliff-top at Haria is actually a gigantic radar installation and the white buildings of the town nestled in the terraced green valley are highlighted in sharp contrast towards sunset. Beware of orographic cloud. I was not paying attention and, looking down and back to locate a German hang glider that had been flying near me, I saw instead of the cliff, a wall of grey. As I accelerated seawards, the cloud formed around me faster than I could fly. With the airflow tearing at my sleeves, I aimed at a hazy and shifting spot of blue ahead. Eventually I emerged from the front of the cloud and, well out over the sea, I steered along its front edge back towards the flat land several miles away to the south, my legs shaking in the harness. And there was the German glider, having also escaped from the cloud. I wondered if its pilot also had the shakes. So then why did I start shaking almost uncontrollably when I got the beast flying straight and level, headed more or less to the west? The whole incident had happened so quickly, was so intense and disorienting, that I’d had no time to be afraid. Adrenaline was pumping and my reaction after the sudden return to normalcy of the steady, soothing hum of the Mustang engine in the relative security of my snug cockpit made everything let go at once. I remember being glad to be alone in my plane, without a witness to my aftershock. If you land on the beach at Caleta, ignore the row of triangular flags. They are made of metal and welded in a fixed direction! Digression: For an anecdote in Lanzarote involving the editor of a monthly aviation magazine, see Only once. In 1993, I bought a pre-owned Airwave 166 Magic IV. (Magic? See my opinions about Hang glider names.) Not only was its performance superior to that of the Vision, its handling was also superior. However, at 80 lb, it was a heavy glider to carry. I continued to use my 1970s harness, although it was rebuilt in about 1990 to improve its strength and safety. The air-tube system for taking photos in the air was clumsy and only semi-reliable, so I obtained a Ricoh FF-9 35mm compact camera with a wire-activated remote release. A switch on the control bar bridged two wires (which ran together in the same thin and unobtrusive cable) that closed the electric circuit that fired the camera. Alternatively — and most reliably of all — the Ricoh FF-9 could be set to take a photo every minute until the film ran out. Clipped in and third in line, Neil shuffled his wing forwards two metres nearer the ramp. There was a shout. Those around him looked up at the sky, some shading their eyes with their hands, one woman using her other hand to cover her mouth. 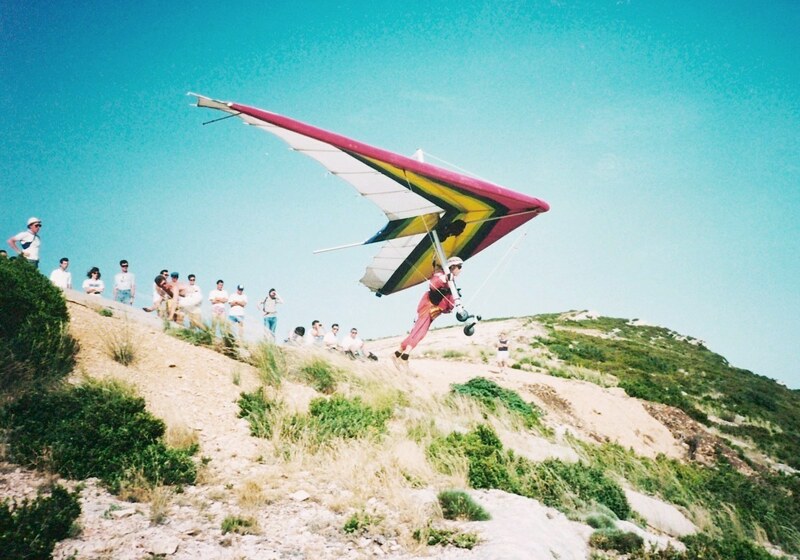 Restrained by his attachment to the hang glider he reached forward, grasped its fore-cables, and craned his neck to see upwards past the starboard leading edge. 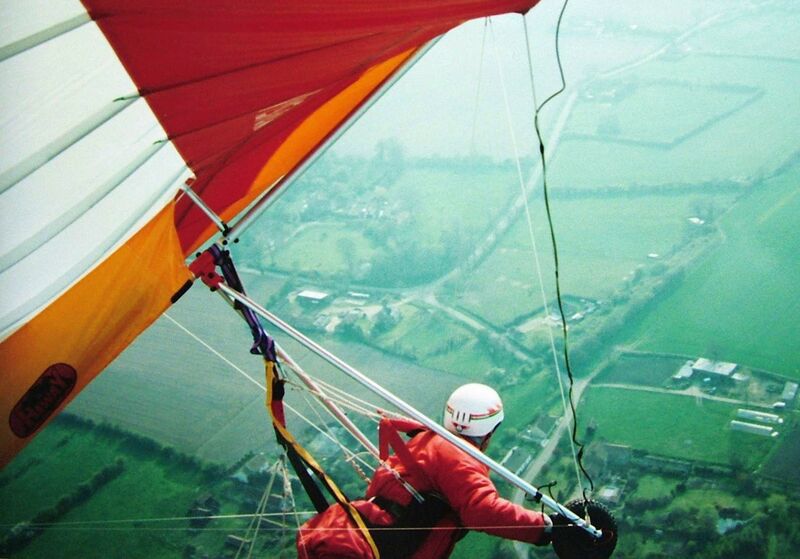 Two hang gliders, eight hundred feet above, were locked together and spinning. Something streamed from one, elongated, angled upwards, and blossomed into a parachute. The two gliders parted and the pilot of the other deployed his own parachute. The first glider swung radically, lifting, stalling, swinging down, un-stalling and lifting again, its crouching pilot standing in the control frame, all under parachute. The other glider stabilised in a slow upside-down spin, its pilot having fallen over the trailing edge. While firmly attached to the rig and parachute by his harness, he steadied himself by holding on to the downward-pointing king post. The distorted shape of the wing indicated that both leading edge tubes were broken. 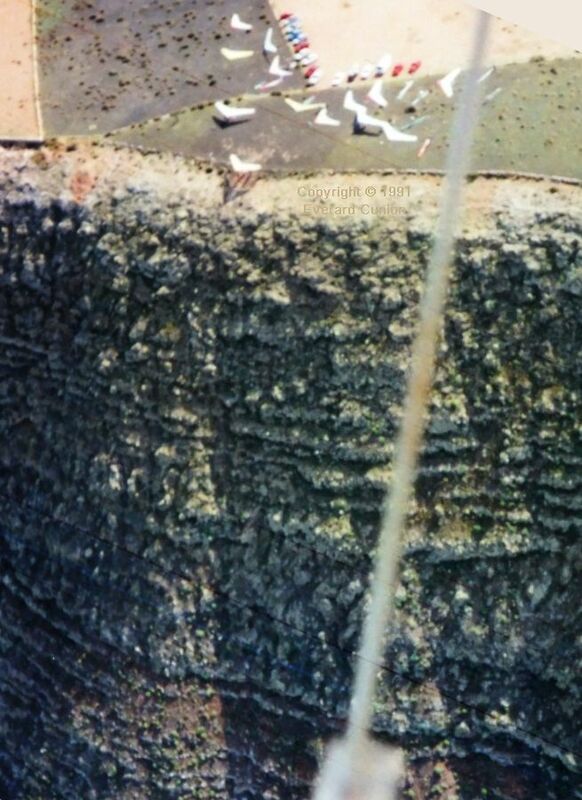 The first glider struck the ground on a rocky ledge a half mile away and the other touched down half a minute later out of sight behind a ridge. Two jeeps trailing dust sped towards the downed wings. In reality, it was a single (accidental) parachute deployment, the description of the first glider being what I saw. In the distance, on the other side of the valley, white specks moved against a grey-forested mountainside topped with layers of rock strata at twenty degrees to the horizontal. Some of the specks circled and gained height while drifting in the same direction as Neil. Others inched slowly in the opposite direction, up-wind, sinking. One day at Ager the wind became stronger as late afternoon became evening. Others de-rigged. However, the wind was smooth and not too strong for my old Airwave 166 Magic IV, so I launched and had a good flight. I was told afterwards that my launch inspired a round of applause from the small crowd that witnessed it! One of my old experimental hang gliders — the airframe at least — found a new purpose. My simulator rig used the Microsoft Flight Simulator program in glider mode. A joystick mounted atop the hang glider frame was connected by elastic chords to the poles from which the airframe hung, so the stick deflected according to the pilot’s weight shift, which tilted the rig. Amazingly, it worked perfectly! The only special part I had to order was a joystick extension lead. Eventually I donated the rig to a hang gliding and paragliding school. Two years later I went back to college and my final year project was a feasibility study of using flight simulators to teach collision avoidance to hang glider and paraglider pilots. I drew on a document detailing a symposium of flight simulator technology held the previous year, chaired by NASA aeronautical engineer and hang glider pilot Seth B. Anderson.